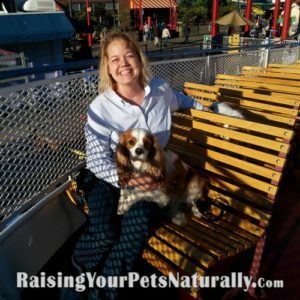 A few months ago I wrote an article called Dog Bucket List: 10 REAL Things to Do with Your Dog Before You Die. I stressed in the dog bucket list article REAL because I really think as dog parents, we need to set doable expectations. 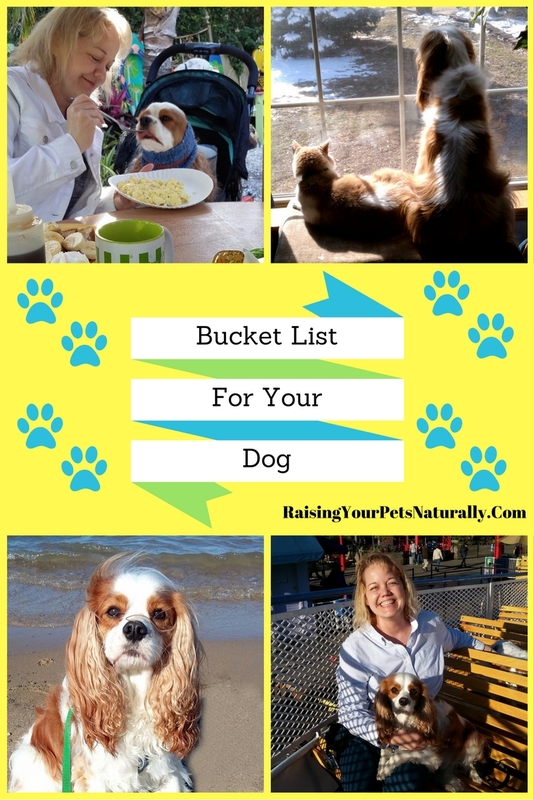 If our bucket list for dogs is too complicated, then we are unlikely to meet the challenge. Last year when I was thinking of a good dog bucket list, I thought it would be fun to have dog-friendly bucket list vacations. Dexter and I could travel across the US and try to hit all fifty states and do something fun and exciting in each state. 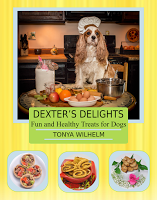 It would be fun to travel with Dexter The Dog and get some great dog photographs to remember our adventures. Then it hit me. This wasn’t Dexter’s bucket list, this was MY bucket list. Why doesn’t traveling across the United States with my dog go on his bucket list? I mean, Dexter loves to travel and go on outdoor adventures. But Dexter doesn’t care if it’s a new state or new beach, he only cares that he’s with me and on any adventure. So, that got me thinking about what would make DEXTER happy. If he would write down a dog bucket list, what would he put on that list? So, here are my top 5 guesses on what would make Dexter’s bucket list, in no particular order. Spend quality time with his family: me, Grandma, and Eddie. By quality time, I mean for us to pay attention to him, talk to him, and not be distracted by phones, computers, etc. Eat and eat some more. This boy is a foodie. It doesn’t really matter what it is – he loves to eat. I think Dexter would love for me to sit down and spoon feed him a delicious meal fit for a king. Go on a sniffing walk. Dexter loves to sniff and his nose has lots of places to take him. He would enjoy a day of walking where he wants, smelling what he wants, and stopping when he is inclined. Go on a boat ride. Dexter really enjoys sitting in my lap and smelling the ocean or lake waft through his ears and into his nose. He enjoys watching the waves crash the bow of the boat and the birds flying overhead. Playing games. Dexter is an interactive player. He gets a big boost out of playing games and learning new games. It doesn’t matter if it’s fetch, hide and seek, tricks or whatever – he’s all in when we play. Have you noticed that Dexter’s bucket list is in past tense? That’s because I work really hard at trying to provide Dexter a full life and I try to think of what HE wants. Obviously, I can’t know for sure, but I think Dexter feels that his life is full. But just because I can check off Dexter’s top 5 bucket list ideas, doesn’t mean that I don’t repeat them or look for other fun dog adventures. I try to connect with Dexter on a daily basis and let him guide me in our activity. Now, turn off the computer and go play with your dog! 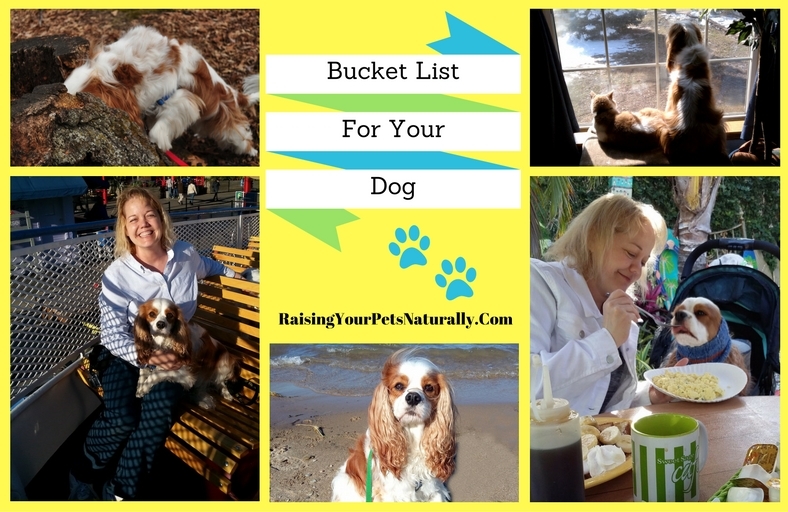 What would be on your dog’s bucket list? What about your cat? Tell me in the comments. This is good bucket list! Number 4 has been on my bucket list for 2 years & I haven’t done it. I hoped to be able to do it this Summer but our hectic move didn’t allow for it. Oh, you must go on a boat ride! That’s so much fun. I love this idea! Magic enjoys “sniffing walks” too. Great idea and nice post. It’s a good reminder to enjoy life. Thanks. 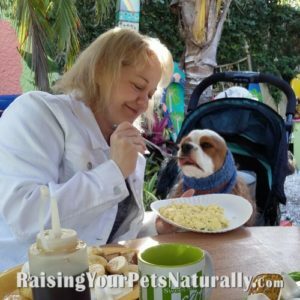 My hope is that people will really take time every day to connect to their family and pets. Great idea. I don’t travel with the girls, but I wish I could. I love the idea of a bucket list. Our previous dog, Pip, loved water. I had always dreamed of taking him to the ocean, but unfortunately we never made it. I learned my lesson not to wait and took our new dog, Ruby, to the ocean during our first summer together. So sorry about Pip. From what I’ve read, Pip was a very lucky and loved dog. Don’t regret. I am sad to say that eating fast food would probably be at the top of Theo’s bucket list. He just LOVES to eat. Other than that, he likes to go for walks, play tug and just be with us. I would love to take him to a beach, but I don’t know if that will happen. LOL I’ve been known to give Dexter a Fry-Fry every once in awhile. What a perfect time for a post about doing all the things that make you happy. Happy Thanksgiving! Thanks, Paul. <3 Happy Thanksgiving to you and your family too. What a great bucket list I think dogs just as humans need them. Mr. N would love to be able to catch a squirrel. Or mice! We’ve tried Barn Hunt but he finds it boring. He prefers lure coursing. Maybe he’ll get to de-infest a real barn one day. Maybe he can catch the lure one day! Love the idea of doing it now! On my Huskies’ bucket list – play in snow tops the list. Last year we did not get any (other than a few flurries). So I’m hoping for enough snow this year to let them be snowdogs and have a blast! Great post. Having a bucket list is a great way to help us to remember how to enjoy special moments with each other. We haven’t assembled one yet, but this post makes me think that we probably should. Thanks, Bryn. That makes me happy. Nice bucket list. Something on my dog bucket list is taking Simba to the beach. Go! Dexter is such a beach bum. Great bucket list and I believe we should take each adventure/opportunity that is thrown our way, I live like that and I think it is from living most of my life in Israel and never knowing what tomorrow would bring. Thanks, Ruth. I couldn’t agree more. Lucky’s would have been to finally catch a squirrel. Oh, he would be so proud of himself!